There are transaction fees for online payments. 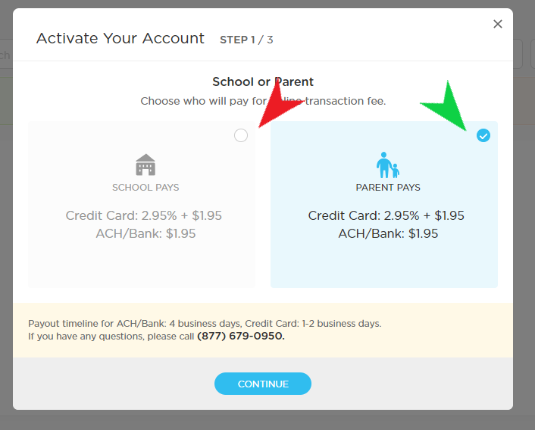 When you first sign up to accept online payments from parents, the default setting is for parents to pay the transaction fees; however, you can choose to have the school absorb these transaction fees so the parents do not see them. If the parents assume the transaction fees then any invoices you send will be deposited in full into your account. The parents will pay what they owe to the school PLUS any associated transaction fees. If the school assumes the transaction fees than any invoices you send will be deposited MINUS the transaction fee into your school's account. When first signing up to accept online payments you have the option to choose either school (red arrow below) or parent (green arrow below) payment of the fees. If you have already signed up for billing but wish to have your transaction fee assignment changed, send us a message using the chat window on the bottom right side of this screen. You can choose to accept only ACH payments from parents. This can be helpful if you want to absorb the fees but want to ensure fixed, predictable transaction fees. To accept only ACH payments send us a message with your request using the chat window at the bottom right side of this page.